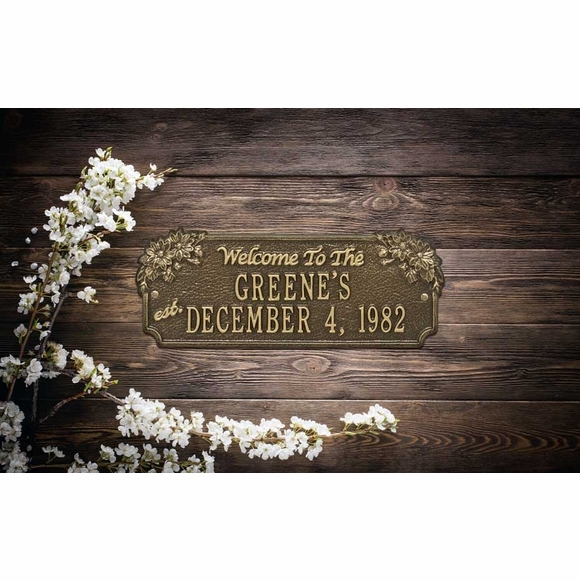 Established Year Welcome Plaque - - with floral theme. Makes a great personalized housewarming gift, wedding gift, or anniversary gift. 16.0" x 6.25" enhanced rectangle. Wall mount. Made in USA. Clusters of daisies in the upper corners as well as the words "Welcome To The" and "est." are part of the design. Line 1 holds up to fourteen (14) 1.25" characters. Line 2 holds up to sixteen (16) 1.25" characters. Large image color is antique brass. Smaller images colors (from left to right) are antique brass, antique copper, black/gold, bronze verde, oil rubbed bronze, bronze/gold, and pewter/silver. Dimensions: 16.0" x 6.25" x 0.32". Floral theme welcome plaque. Made in USA.